What you need to know before you start shopping for Japanese tea sets for brewing sencha, matcha and gyokuro. For centuries, Japan has taken pride in the quality and beauty of its tea sets. Although Japanese tea ware serves a utilitarian function, they are more than just kitchenware. They are also art objects in their own right. They are usually made from three materials: porcelain, clay or cast-iron. Starting in the early 13th century, Japanese tea sets were produced at kilns in Seto, Japan. They were originally modeled after tea sets from China. At first, much of the pottery produced here mimicked the white and green celadon pottery that was popular in China at the time. However, a ceramics artist named Kato Shirozaemon Kagemase brought back a new style from Chinese Buddhist temples - simple tenmoku tea bowls decorated with deep brown glaze. What is the Tenmoku Glaze? Tenmoku glazed ware is renowned for its variability. The glazes can range in color from dark plum (persimmon), to yellow, to brown, to black. 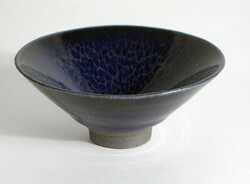 Tenmoku glaze is comprised of feldspar, limestone, and iron oxide. The more quickly a piece is cooled, the blacker the glaze will be. The new style attracted more potters to the area, and Seto became famous for its handmade Japanese tea ware. As tea gained more and more of a foothold in Japanese culture, Japan's ceramic artists developed their own unique styles, although they were influenced by trends from both China and Korea. A variety of tea bowls, tea cups and tea pots were developed to suit both practitioners of the Japanese tea ceremony and the less formal tradition of drinking sencha with friends. Six towns became especially famous for producing ceramics and other teaware: Bizen, Echizen, Seto, Shigaraki/Iga, Tamba, and Tokoname. These towns are known as the Six Old Kilns of Japan, and most of them still produce high-quality teaware today. Japanese tea sets come in an astounding variety of sizes, designs and price ranges. How do you know what type of which is right for you? They do not have as many components as British tea sets do. They often consist of simply a tea pot for brewing tea and cups to drink from. Consider how many people you intend to brew tea for. If it is just going to be for you and a friend, a smaller tea pot is better, as it keeps the tea from getting cold in between cups. Consider the design and materials of the tea set. Do you want a ceramic set? Ceramic Japanese tea sets often have a simple, handcrafted beauty. Some are brightly painted, usually with natural designs like flowers or dragonflies. They are easy to care for, but of course they can break if you are not careful. Cast iron tea ware often involve using a a kettle called tetsubin that can keep water warm for hours. You can also insert an infuser basket into it for brewing tea. This is discussed in Tetsubin Tea Pot Review. Japanese tea cups usually do not have handles. Tea pots may be traditional tea pots with loop handles or side-handles. Japanese green teas are finicky about brewing temperature, so sometimes a separate vessel called a yuzamashi is included to help cool the water. The most important item to consider is what type of tea you intend to brew. When buying Japanese tea sets, a useful rule of thumb is to use small pots and cups for the higher grades, such as a gyokuro. 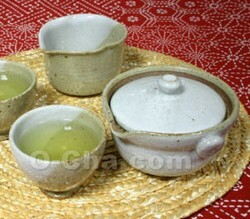 For example, this Shiboridash tea pot set is made just for gyokuro. It includes a houbin, which is a small tea pot designed for brewing gyokuro. It holds just the right amount of water for brewing small amounts of tea. It also includes a yuzamashi and 2 small tea cups. The cups are white inside so that you can admire the emerald green of the tea liquor. The yuzamashi helps you quickly cool the water to the correct temperature. Japanese tea cups are known as yunomi chawan or simply yunomi. They are for drinking loose-leaves such as sencha or gyokuro.